If you thought you were excited for The Walking Dead season 3 premiere this Sunday, think again. 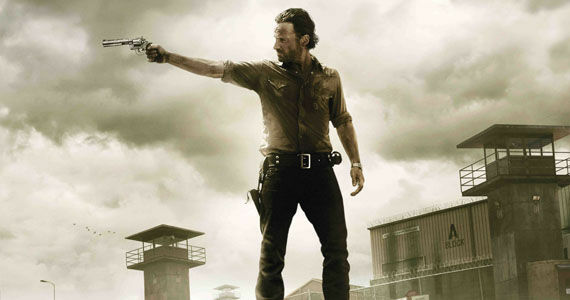 While fans have been waiting seven months to see what happens when Rick and Co. enter the prison, the show's producers have been waiting almost three years – because season 3 is what they've wanted to see from the start. Speaking with Daily Dead, executive producer Gale Anne Hurd talked about how everyone (including Frank Darabont), knowing what happens in the comics, was waiting with anticipation to tackle the stories that will take place in season 3. Additionally, Hurd explains how they'll continue keep comic book readers from knowing exactly what's going to happen on the show. From the very beginning, with Frank, Robert, and myself, this is something we were so eager to get to. Knowing in the third season we would be able to tell these stories, we were thinking about how to bring them to life with the scale of a TV production. Thankfully, we had two seasons to prepare for this. We also had the fantastic opportunity to audition and cast for these roles. Because of the success and critical acclaim of the TV show and Robert’s comic book series, we were able to get really fine actors to bring these characters to life. Like the show's producers, fans of The Walking Dead comic have been patiently waiting to see how the television series will tackle the highly volatile prison environment. Though some fans of the series have complained that the singular story of survival was moving a bit slow, the introduction of the prison environment marks a drastic shift in tone for the show. If you thought zombies were terrifying, just wait until you see what humans can do. With new integral characters added, namely the Governor and Michonne, and a new environment, audiences will see an evolution of all the series characters, as the group of survivors will be pushed to the limits, slowly reaching their breaking point. But exactly how far will The Walking Dead season 3 push those limits? For those unfamiliar with the comics, the prison environment will serve as an extended stay for Rick's traveling caravan. Covering much of season 3 and 4, the survivors will be forced to take on zombies and humans alike, all for the purpose of survival. Over the course of these two seasons, many controversial scenes, including many controversial moments, will occur. Previously, executive producer Glen Mazzara revealed that, because The Walking Dead is a mature-rated series on cable, they will not shy away from tackling even the most uncomfortable scenes, as long as they stay true to the series and its characters. What’s important is to let the TV series remain true to characters and stories that have come before. At the same time, we take inspiration from the comic. There will continue to be iconic moments from the comic book, but always with a twist which will keep people off balance. It’s not just to keep people guessing, but evolves from the storytelling. Whatever twists the producers decided to add to the series, it's refreshing to hear that, whatever the side-steps may be, they'll stay true to the characters and story, because, after all, that's what's most important. Having already seen the first two episodes of the upcoming season, it's fair to say that there are more than enough suspenseful, cringe-worthy moments to reinvigorate any waning Walking Dead viewers. What are those moments? You'll have to wait and see for yourself. Just remember: Fear the living!